Cajamarca Conga no va Newmont Mining Campesinos und die Polizei – Blog von Peru Reiseveranstalter Chirimoya Tours. High Noon at Cajamarca Central Square hoffentlich nur lokal. 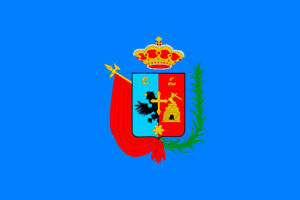 Fahne von Cajamarca in Peru.